What do you need to know before you buy an e-bike? 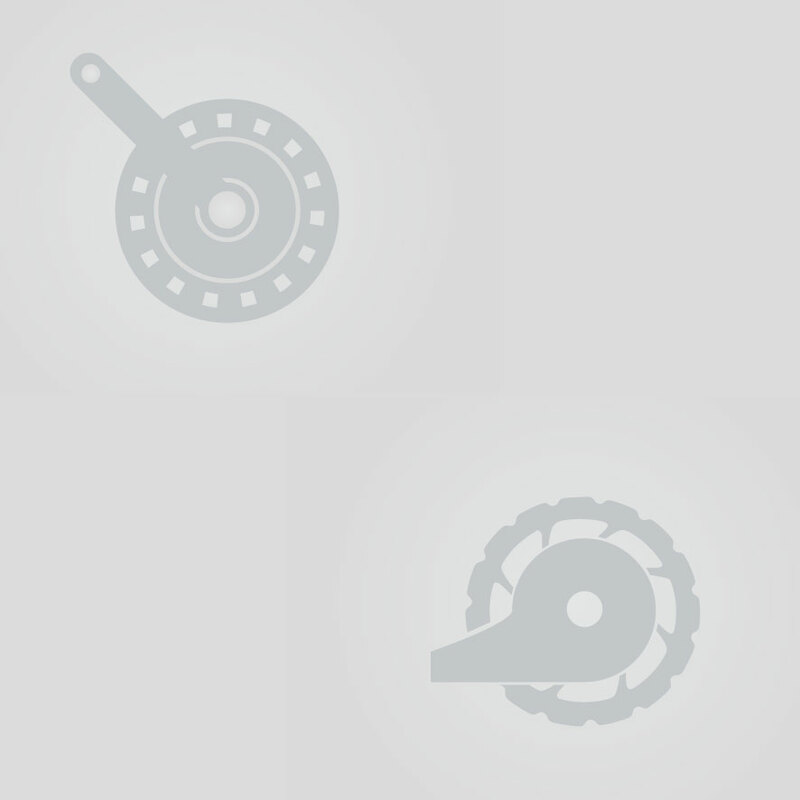 On this page, you will find everything you need to know when acquiring an e-bike. This makes choosing an e-bike even simpler. An e-bike combines your own effort with the power of an electric motor. This motor assists you up to around 25 kilometres per hour. The current for that 'extra boost' is supplied by the battery, which is often located in the rear carrier. 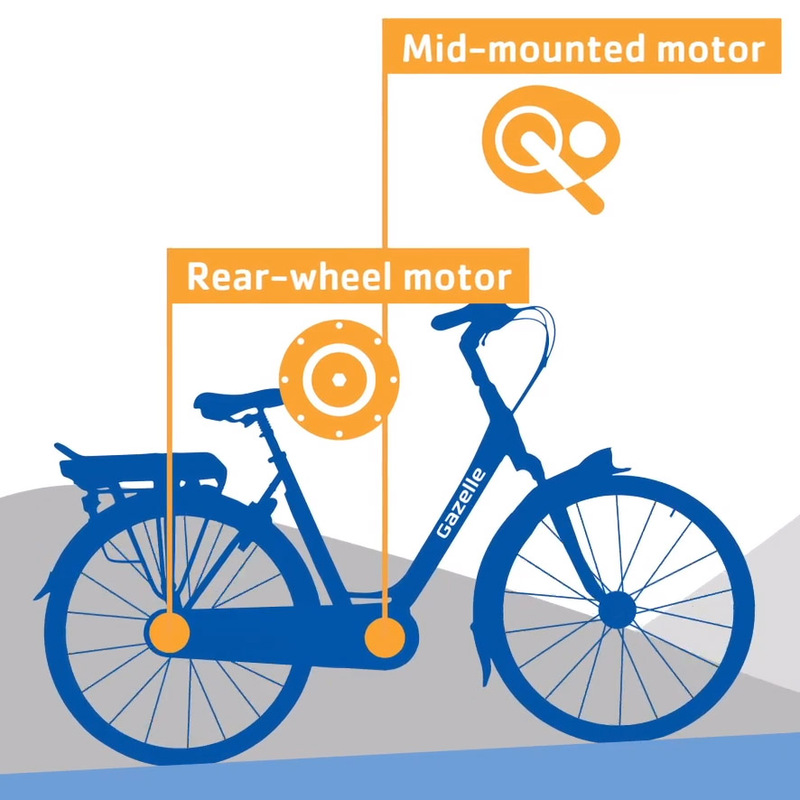 The motor in an e-bike is located in the middle of the bike, in the rear wheel or in the front wheel. Smart sensors measure your speed, your pedal force or your pedal rotation and use this information to provide the appropriate electric assistance. An e-bike is very easy to operate, with controls on the handlebar. This is where you select your level of assistance for example. There is also a display on your handlebar, with readouts for everything, such as how fast you are going or how far you have already travelled. What will you be using the bike for? 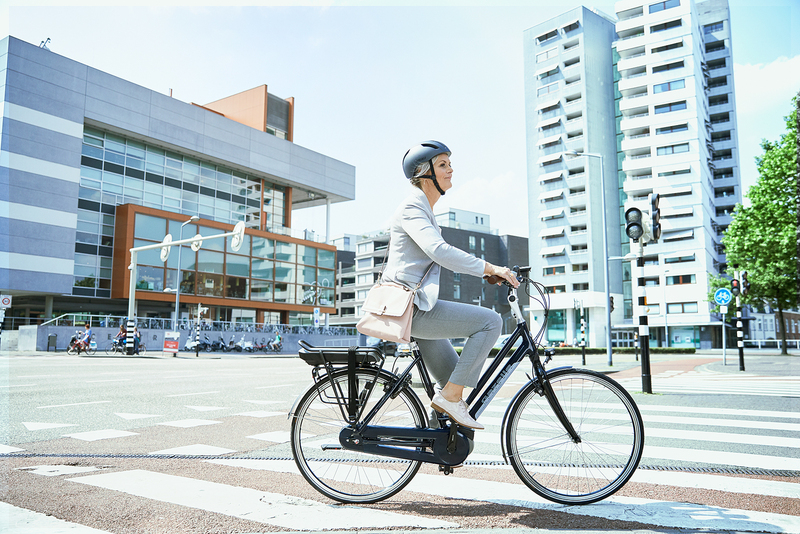 Your choice of an e-bike depends not only on your personal preferences and budget, how you will be using the bike is also an important factor. Is the bike for short daily local trips or commuting to work? If so, you will want an e-bike that gives you the appropriate assistance quickly, without requiring an effort on your part. 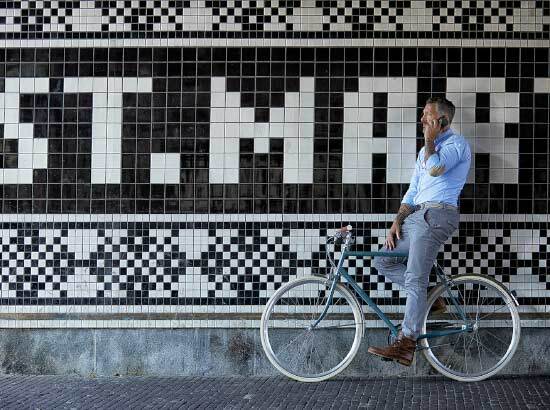 Do you often cycle for long distances at a time or go on cycling holidays? If so, you will want a bike with a battery that provides assistance for longer. How you use it therefore will determine your choice of the various (technical) components. What is your budget for an e-bike? The price of an e-bike starts at around € 1,000 rising to over € 6,000. It is also true in this regard that a good e-bike need not be the most expensive. Your choice of components and features will determine the price of the bike. Do you have a (limited) budget? If you do, then decide which e-bike features are most important for you and use them as the starting point in the search for your ideal bike. An e-bike uses a battery and motor to provide assistance while cycling. When you get assistance, and how much, is determined by sensors. All e-bikes are equipped with a speed sensor. This sensor measures how fast you are travelling and ensures that assistance cuts out as soon as you reach a speed of 25 kilometres per hour. The way in which assistance is provided while cycling is determined by the type of sensor. You have a choice of two types of sensor. The rotation sensor senses whether the pedals are rotating. Assistance will kick in with a small delay as soon as you start pedalling. This means that an e-bike does not provide assistance immediately when you set off. The assistance will not be perceptible until after around one revolution of the wheels. 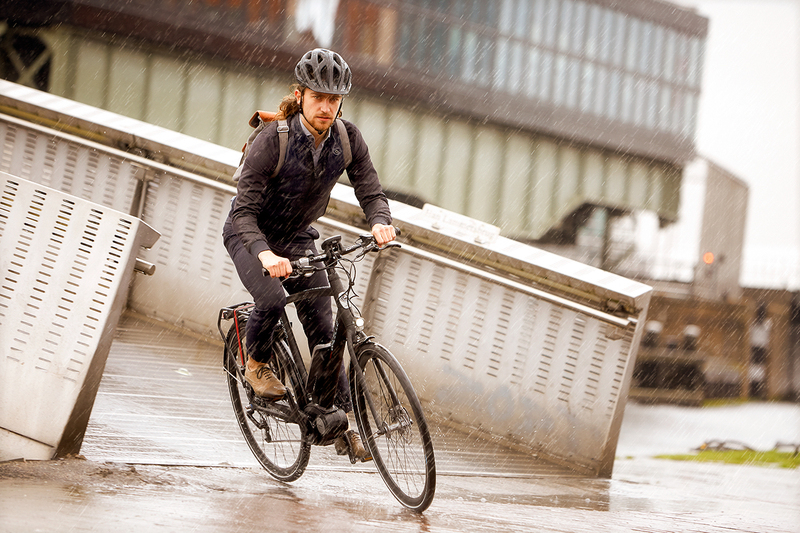 If you stop pedalling or apply the brakes, then the assistance will cut out after a small delay. It makes no difference to the rotation sensor how much force you apply to the pedals, you will always get maximum assistance. The degree of assistance is determined on the basis of the speed in the selected setting. The pedal force sensor senses not only whether the pedals are rotating, but also how much force you are applying to them. The motor is controlled on the basis of this information and provides more or less assistance directly. You don't notice any delay with it. It means you get exactly the right assistance while cycling. 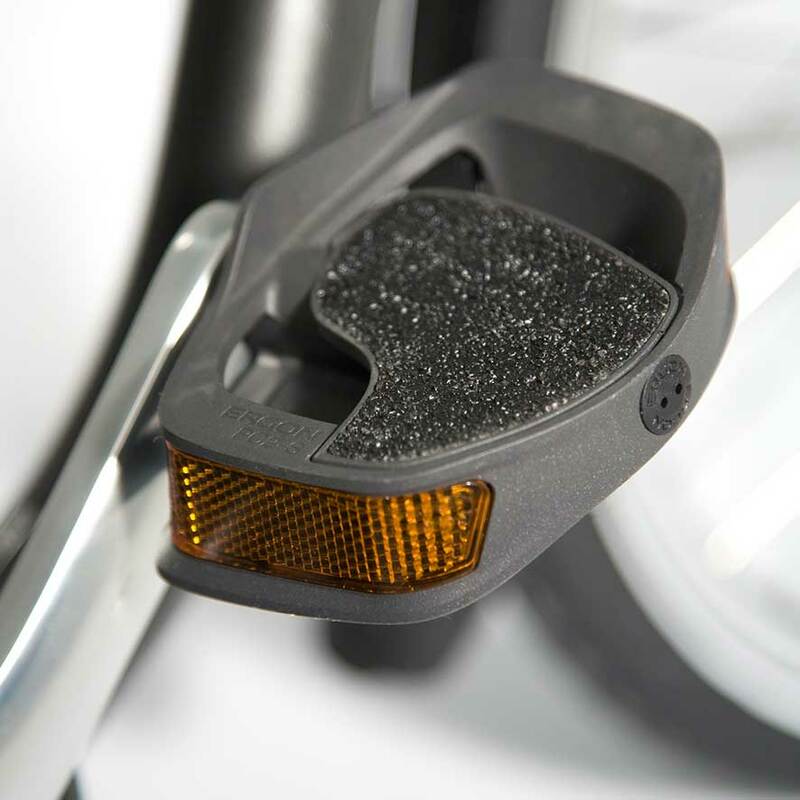 The force sensor ensures that the assistance cuts out immediately you stop pedalling or when you apply the brakes. Would you like to know how the various sensors work and what the difference is between the 2 types of sensor? See the explanation in a video. If the e-bike motor is positioned in the front wheel, it will be as if the bike is being pulled. Due to the extra weight in the front wheel, the bike is heavier to steer than those with the motor in the other positions. 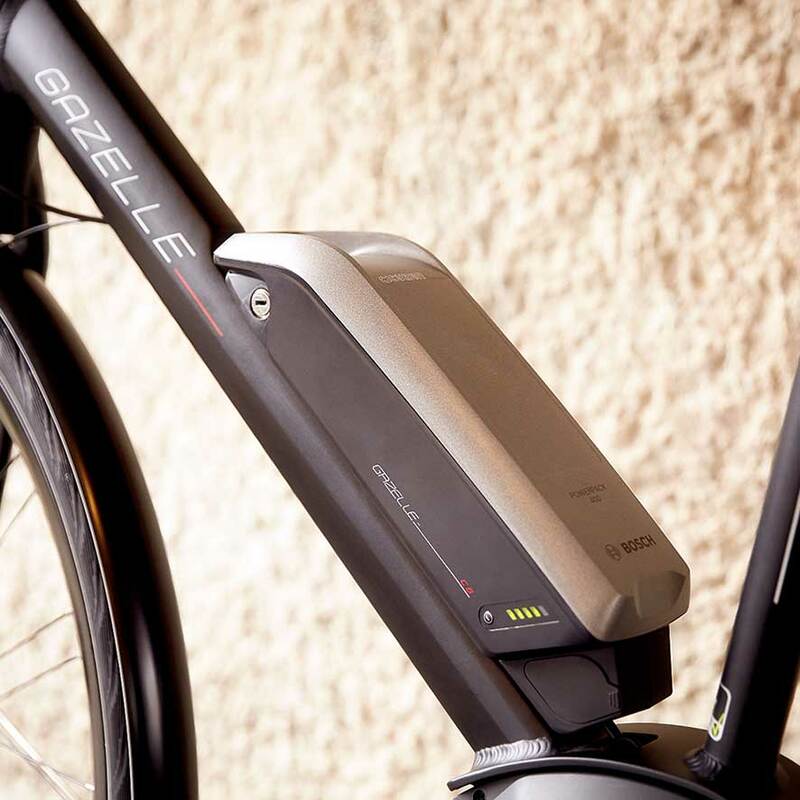 An e-bike with a front-wheel motor is equipped with a rotation sensor. A number of models are equipped with both a rotation sensor and a pedal force sensor. If you opt for a battery under the luggage carrier with a front-wheel motor, then it will counterbalance the weight in the front wheel. The bike will be better balanced with the weight distributed. If the e-bike motor is positioned at the bottom bracket, then the pedals are driven. This is a major difference compared with the drive in the front wheel (front-wheel motor) or in the rear wheel (rear-wheel motor). The electric assistance provides a natural and comfortable feel, but this is offset by the fact that mid-mounted motor bikes are more expensive. The mid-mounted motor is equipped with a rotation and a pedal force sensor. These sensors ensure that you get optimum assistance on the go, based on both speed and the pressure you apply to the pedals. The centre of gravity is in the middle of the bike because the motor is positioned low down and centrally. This gives a feeling of stability while cycling. Cycling on a mid-mounted motor bike is perceived as riding a non-electric bike. 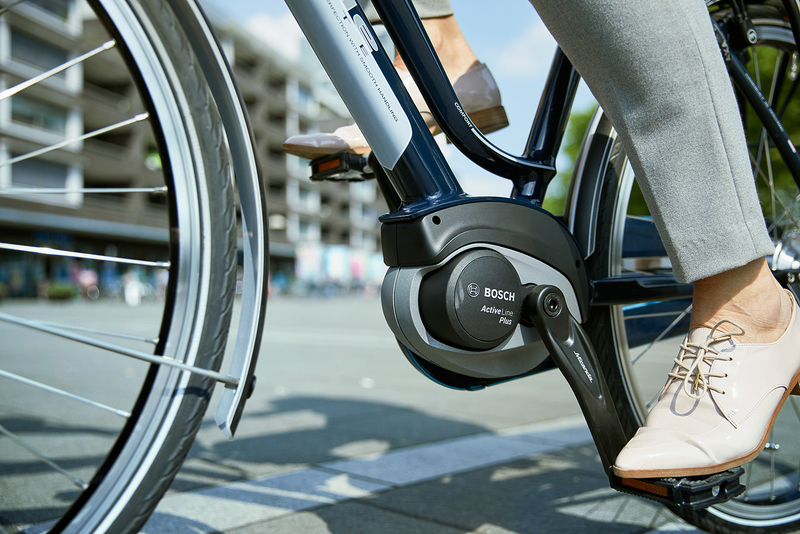 If the e-bike motor is positioned in the rear wheel, then you will perceive the motor assistance as being pushed along. This feels like natural assistance, due the fact that a conventional bike is also driven by the rear wheel. A rear-wheel motor does not generally travel as far on a battery charge as a front-wheel or mid-mounted motor. 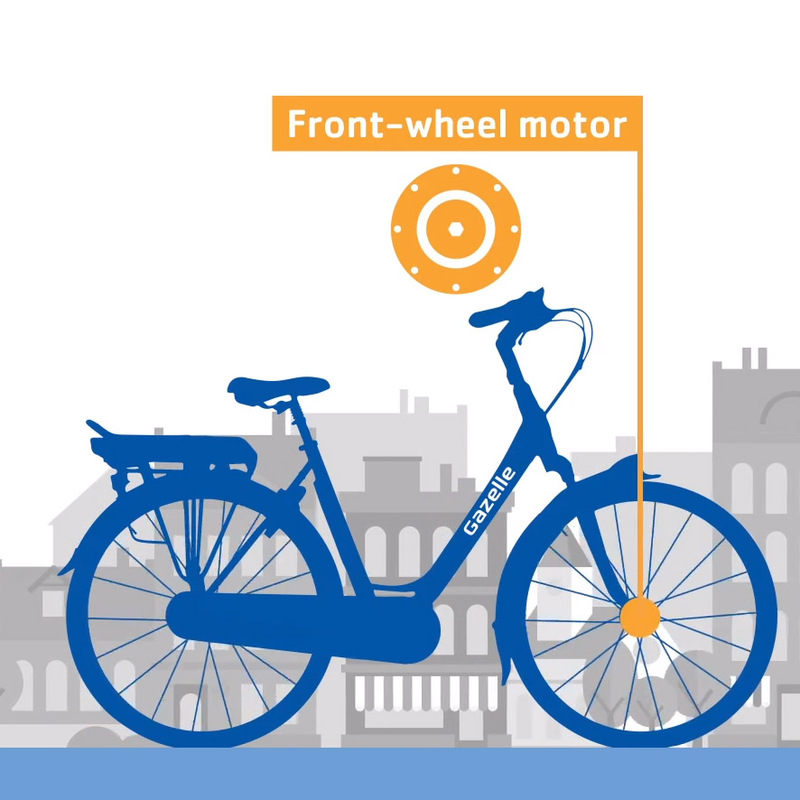 The centre of gravity coincides with the rear wheel and the bike can be given a more natural balance by opting for a battery fitted in the frame. Would you like to know which motor position suits you best? This will depend on, among other things, how you intend to use your e-bike. Check out the explanation in video form. The battery of an e-bike supplies power to the motor. However, the battery also adds weight to the e-bike. Together with the motor and other items, the battery means that an e-bike is six kilos heavier on average than an ordinary bike. This extra weight affects the balance and the centre of gravity of the bike. Depending on the type of e-bike, the battery is fitted under the luggage or front carrier, around the bottom bracket or in/on the frame. Accordingly, it holds that: the lower the battery is positioned on the bike, the more stable the handling. You have a choice of four different positions. Many e-bikes are equipped with a battery under the luggage carrier. It endows front-wheel motor e-bikes with optimum balance. In the other e-bikes it means that the centre of gravity is towards the rear of the bike. 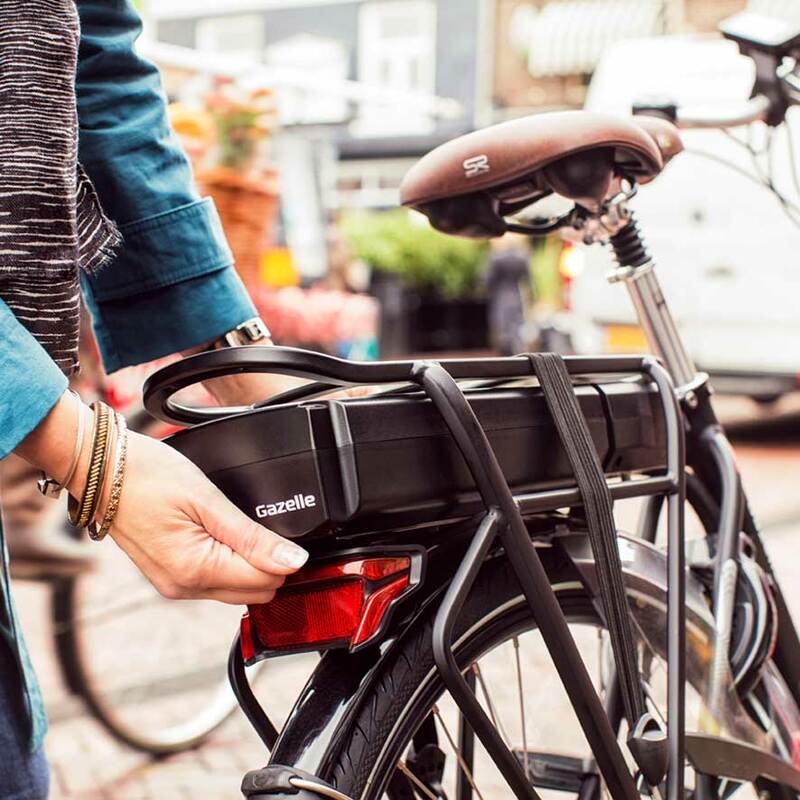 An e-bike battery can be incorporated in the chain case. This makes the bike barely distinguishable from a 'normal' bike. If the battery is incorporated behind the bottom bracket, it will be quite visible. The centre of gravity is positioned centrally, which gives the bike stable handling. 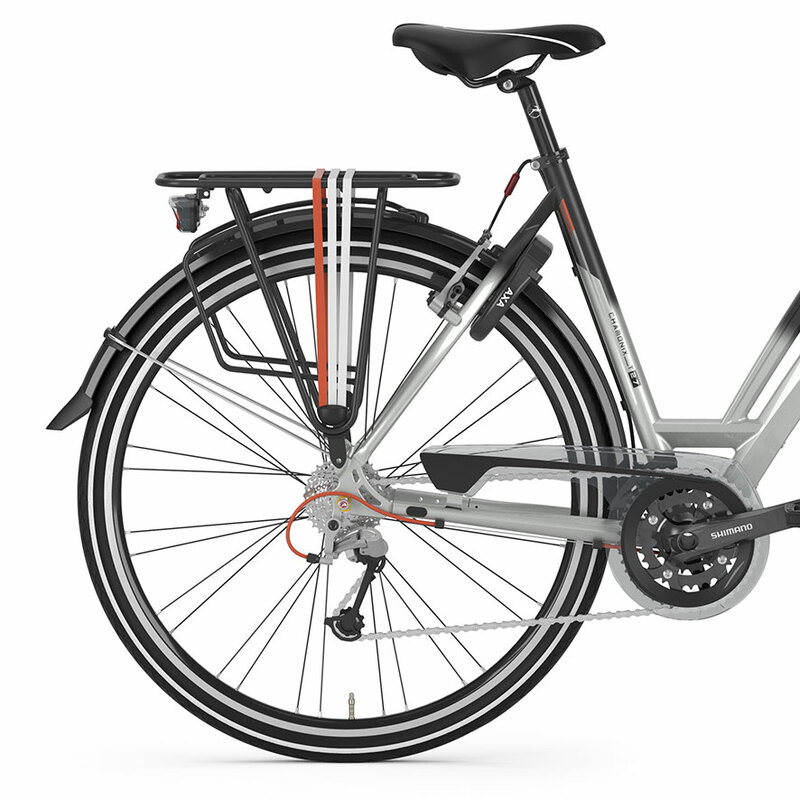 E-bikes with the battery in or on the frame have the centre of gravity in the middle of the bike. 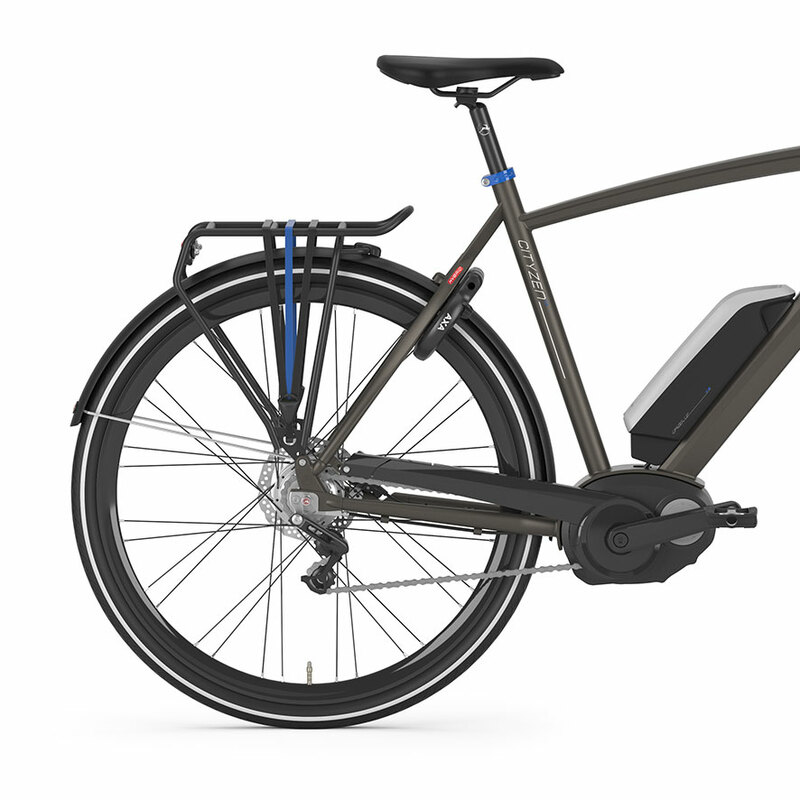 This gives the bike stable handling and due to the positioning of the motor is barely recognisable as an e-bike. 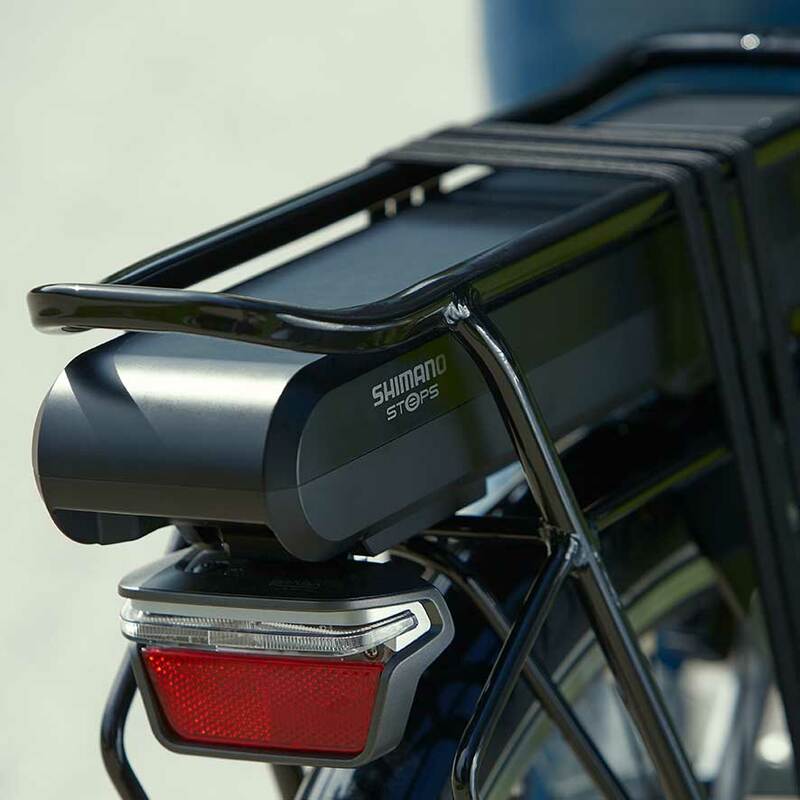 If the bike is fitted with a front carrier, the battery can be fitted under this carrier. This added weight is quite noticeable when steering. An e-bike battery is rechargeable and needs to be recharged regularly in use. You have a choice of two options. If you want flexibility when charging the battery, then your preference will be for a removable battery. The battery is actually supplied with a charger that can be plugged into any mains socket. You simply remove the battery from the e-bike and recharge it at the nearest mains socket. Do you take your bike on a bike carrier regularly? If so, a removable battery is desirable. An e-bike is quite a bit lighter without its battery and easier to lift onto the carrier. The battery powers the motor on an e-bike. The type of battery, like the range, will have an impact on the distance you can travel on your e-bike. There are five different types of battery, four of which are still available on new e-bikes. You will only come across the NiCad, short for nickel-cadmium, type on second-hand e-bikes. The NiMH battery is the successor to the NiCad battery and is the current standard in Europe. This type of battery requires regular charging, even if the e-bike is not being used (for an extended period). The battery must be left connected to the charger at all times. The charger thus ensures that the battery is kept in optimum condition. Allow 4 to 6 hours' charging time for this type of battery. Lithium-ion is known as the generic term for the many batteries containing lithium. This type of battery has a low self-discharge rate and a long(er) useful life. This is offset by the fact that the price of this type of battery is higher. The LiPo battery is one of the better batteries in the Li-ion range. This battery is even smaller than the average Li-ion battery. If the e-bike is not being used for an extended period, it is recommended that this battery should be stored with a 40% charge (preferably in a cool environment). The latest generation of batteries bears the name LiFePO4 (or a derivative of it; LP4, LFP, LFP4). This battery is improved on all fronts which makes it the pick of the crop. However, it is priced accordingly. If you work it out, acquiring an e-bike fitted with a LiFePO4 battery is worth considering, given that the battery will last longer and is less likely to need replacing before the bike itself is due for replacement. There is only a limited range of e-bikes equipped with this type of battery at present. This range will be expanded in the future. If you set great store by the type of gears on your e-bike, it is advisable to decide on your choice early in the selection process for it. The type of gears can in fact have an impact on the position of the motor, the chain case configuration and the maintenance requirement of the bike. You have a choice of three types of gears. The bike chain is shifted between sprockets by means of a shift mechanism. The mechanism and the sprockets are fitted on the rear wheel. With derailleur gears you simply choose an appropriate gear, the large number of sprockets means there is an equally large number of gears available. You will often see this type of gears on sporty e-bikes, due to their weight (lighter than hub gears) and the range of gears. 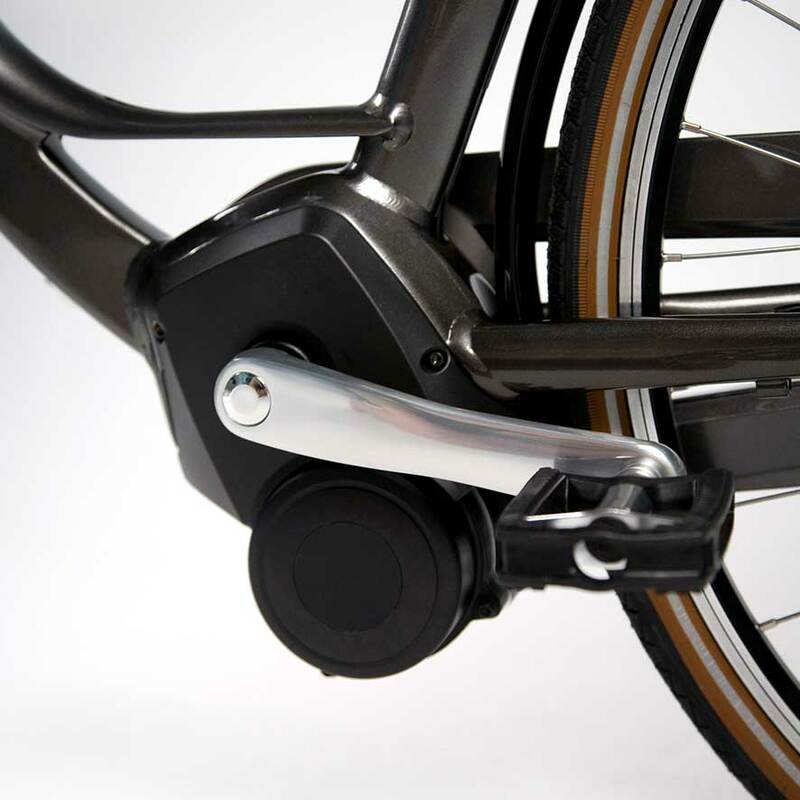 With hub gears, all the gears are concealed in the rear-wheel hub. This means there are no gears or sprockets visible on the bike. There are larger steps between gears and they will adapt less precisely to cycling conditions. Hub gears are sensitive to the pressure applied while pedalling, hence it is better not to pedal while shifting. Damage to the hub gears may result if the pedal assistance is engaged and you don't stop pedalling while shifting. That is why e-bikes with hub gears are sometimes equipped with a shift assist. This assist cuts out the assistance briefly while shifting, thus protecting the hub gears. Hub gears can be equipped with a toothed-belt drive. Because no lubrication is required, the toothed belt requires little maintenance. There are two variants, a manually-operated version and an automatic version. With the automatic variant, the pedal frequency can be set and it is maintained regardless of speed. The system shifts down to the lowest gear when the bike is at a standstill. With automatic or continuously-variable gears you don't have a fixed number of gears available. The number of gears is actually infinite. Using the control on the handlebar (in the form of a rotary switch) you determine yourself how gently or how hard you want to pedal. This type of gears draws more power from the motor, which reduces the range of your e-bike. 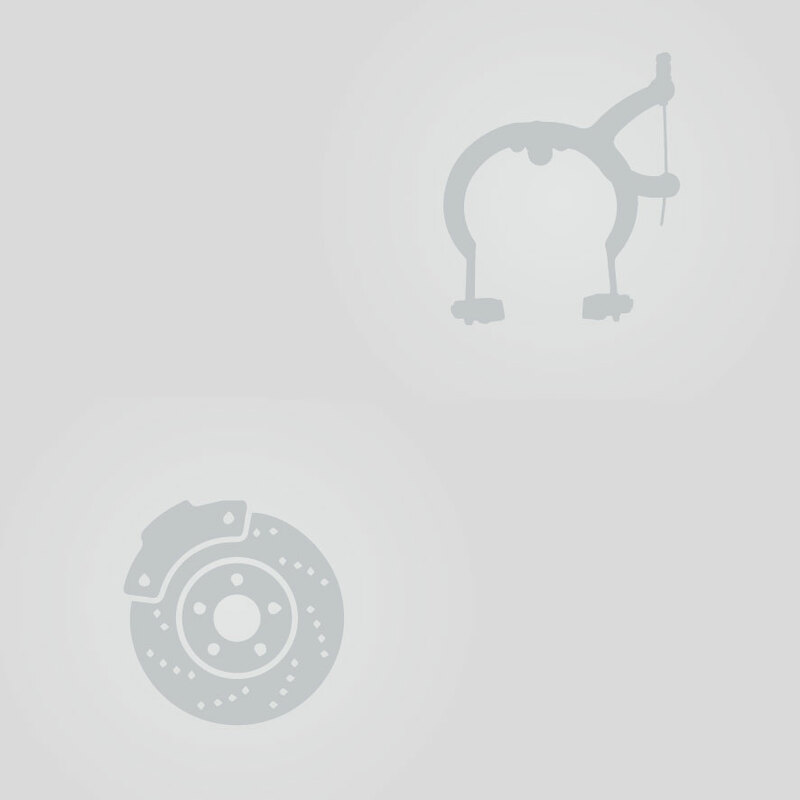 Which type of brake system? 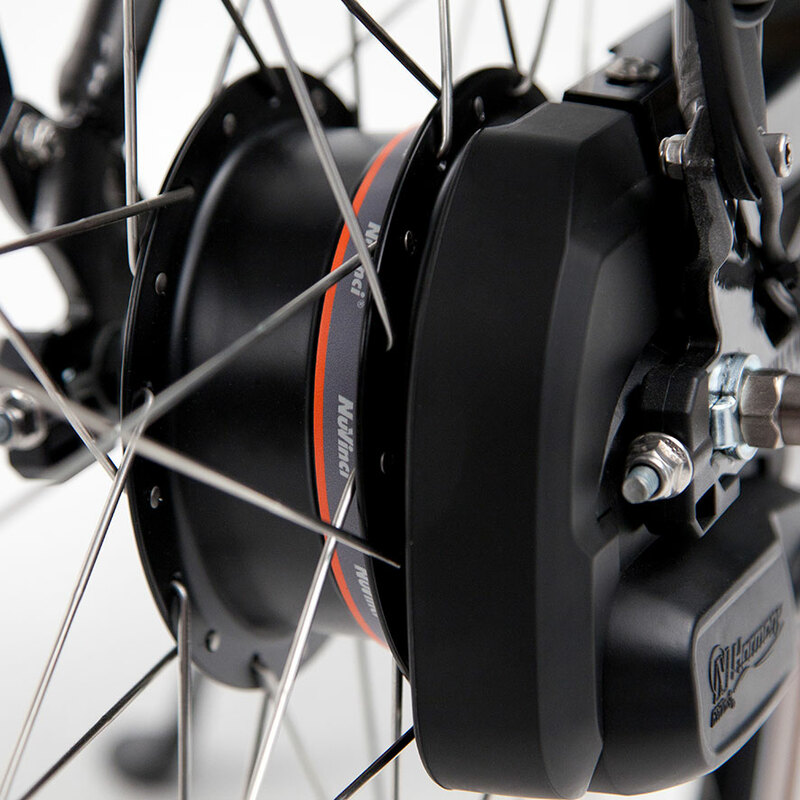 As you can imagine, a powerful brake system is not a superfluous luxury on an e-bike. Thanks to the pedal assistance (that will take you up to 25 kilometres per hour) you will sail along with ease, so it is important to be able to come to a standstill smartly at low as well as high speed. An e-bike features a powerful brake system in the form of a coaster brake and/or hand-operated brakes. Nowadays there is just one e-bike that still features a coaster brake. 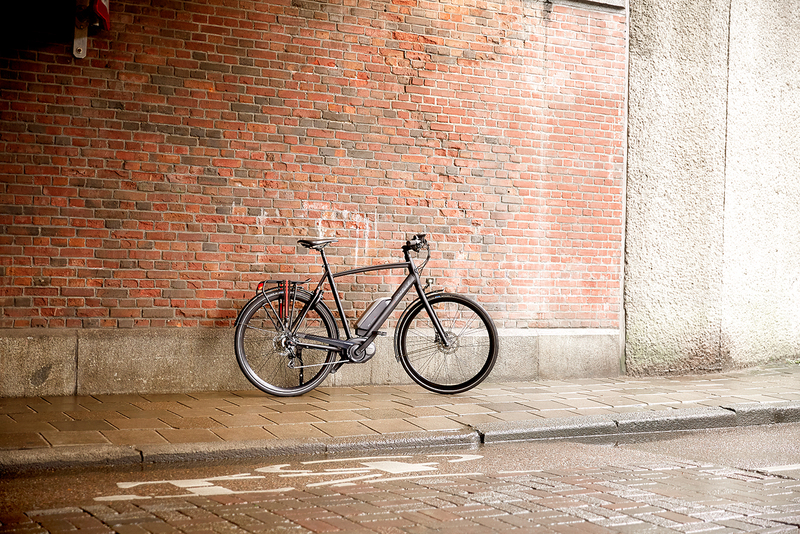 The majority of the e-bike range boasts one (or a combination) of the three types of hand-operated brakes. The coaster brake is featured on a small range of e-bikes. And not without good reason. The coaster brake is a simple powerful brake system that works by back-pedalling. You brake on the rear wheel only, which means that when you brake abruptly, you run the risk of locking the rear wheel and skidding. With this type of brake system pressure is applied (using oil) on the disc located next to the hub. This action is powerful, regardless of weather conditions, but the disc is very sensitive (to corrosion or squealing for example). 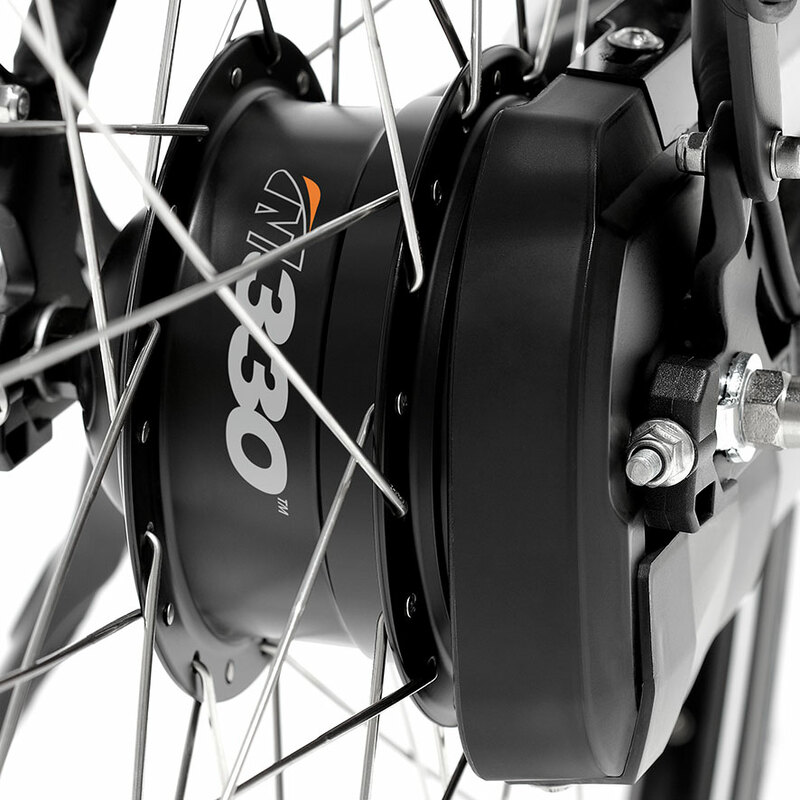 Disc brakes are fitted to somewhat more expensive e-bikes, usually on the sporty versions. With this type of hand-operated brake, also known as a V-brake, synthetic blocks are pressed against the rim while braking. This provides a powerful braking effect, but it also means that the blocks wear during braking. The high-end e-bike segment is equipped with hydraulic rim brakes. With this variant the brake blocks are applied to the rim by oil pressure. 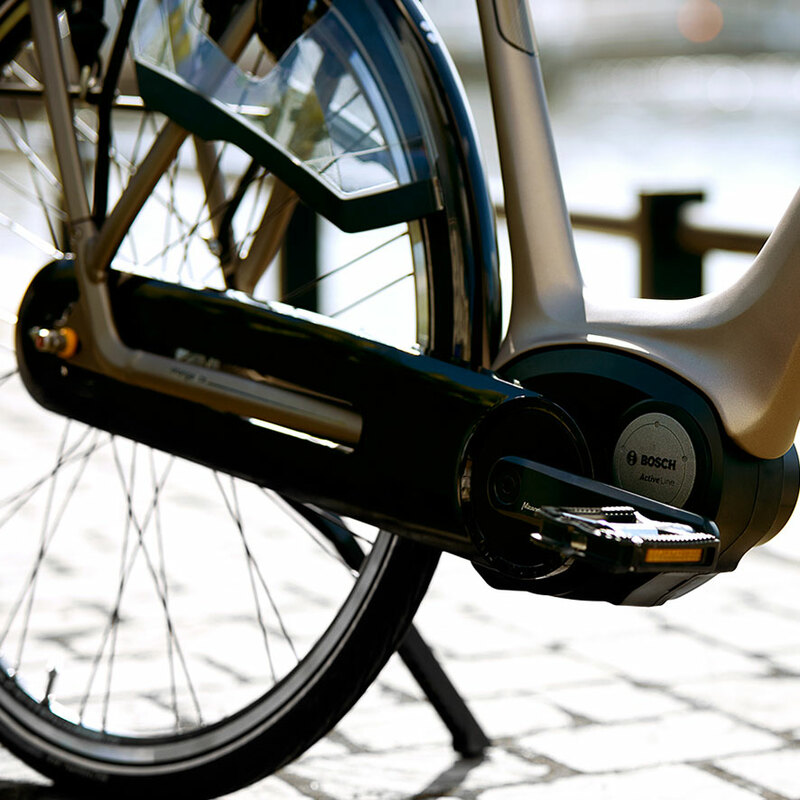 The majority of e-bikes feature roller brakes, a modern version of the traditional drum brake. This is a maintenance-free brake system that works by means of rollers. The rollers are pushed out while braking, which generates the braking force. You can recognise this brake system on an e-bike from the round disc with ridges (in the front or rear wheel). Which type of chain case? If you have a preference for the type of chain case on your e-bike, it is a good idea to include it in the selection at an early stage. This is because the choice of a type of chain case will affect the position of the motor and/or the type of gears. You have a choice of three options. An enclosed chain case is the best option for the useful life of the chain. The chain case protects the chain against moisture and dirt. What is more, the chain case also protects your clothes: the enclosed configuration means that you won't get any lube on your clothing. Like an open chain case, a semi-open chain case is very light, but provides the chain with little or no protection. The chain is exposed to dirt and moisture which means it will require maintenance. Using a chain guard protects your clothing against chain lube and splashes of dirt. An open chain case is very light, but this is offset by the fact that it does not offer the chain any protection at all. This means that the chain will need a great deal of maintenance in view of the fact that it is exposed to dirt and moisture. The lack of a cover means that you risk getting lube stains on your clothing. The majority of e-bikes feature Walk Assist. You use it to activate manual assistance without the pedals having to turn. This can be useful if you are walking up a hill wheeling the bike or don’t have the strength to push your bike along. Walk Assist will provide assistance at walking pace up to a speed of around 4 kilometres per hour. 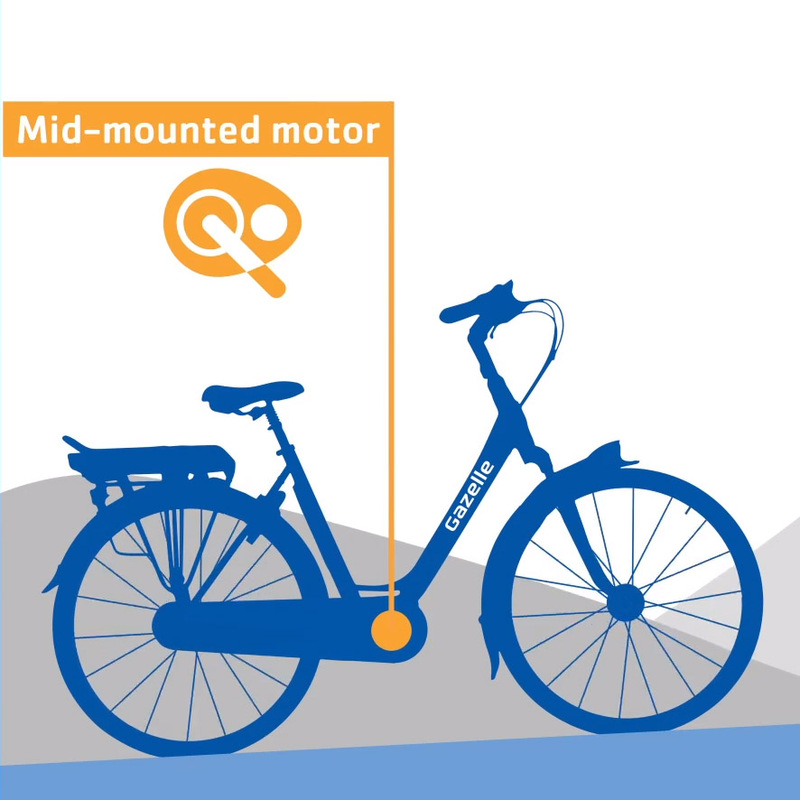 The motor power determines the level of assistance while cycling. Motor torque (rotational force) is expressed in newton metres (Nm) and hence the higher the Nm figure, the greater the assistance the motor is capable of. If your cycle uphill a great deal, then a powerful motor (a minimum of 40 Nm comes to mind) can give you a good boost in doing so. If you cycle a great deal on flat roads, then a less powerful motor (10 to 30 Nm comes to mind) will provide you with all the assistance you need. Bear in mind that a powerful motor draws more power from the battery. The higher the torque output from a motor, the shorter the period over which the battery can supply power for (pedal) assistance. Should you opt for a (more) powerful motor, then it should be positioned ideally around the bottom bracket (mid-mounted motor) or in the rear wheel (rear motor). The power from the motor is then harnessed to give you extra push and assist you from the bottom bracket or the rear wheel. This provides stability and the assistance feels natural while cycling. An e-bike motor can generate noise. The noise level depends on the construction of the motor. 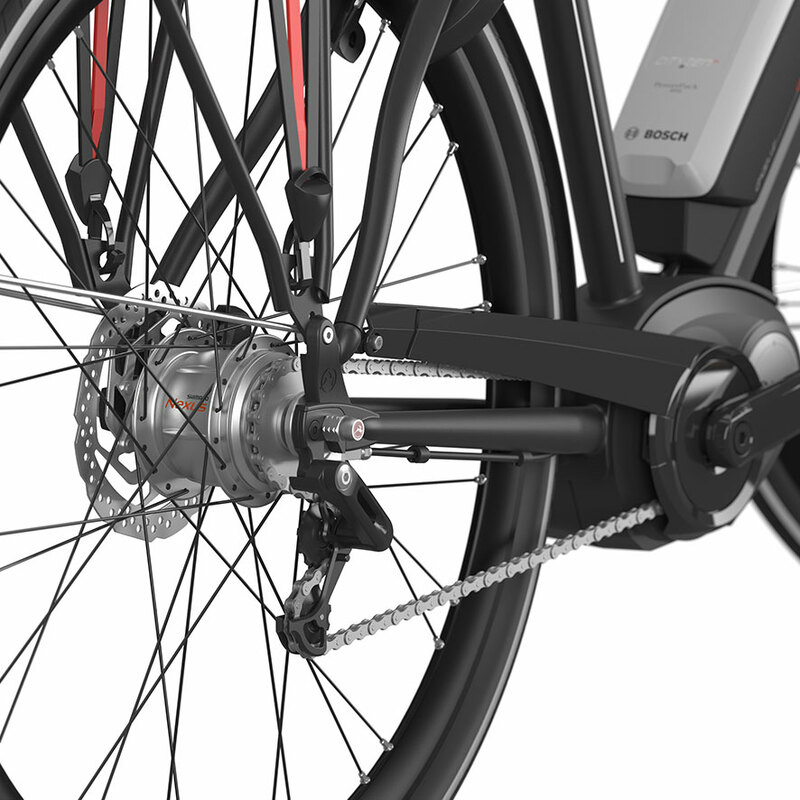 If the e-bike has a geared motor, then the motor will include gears and brushes. This type of motor generates noise which is clearly noticeable on the move. A motor without gearing is silent, because there are no gears or brushes in this type of motor. This type of motor is also known as a direct drive motor. 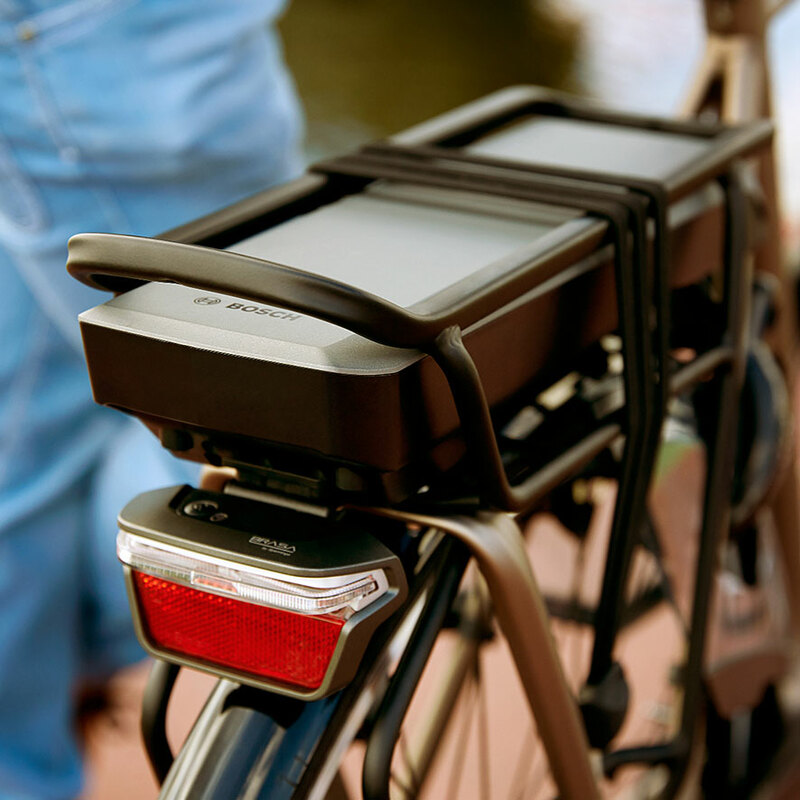 The battery determines to a large extent how far you can travel with assistance on your e-bike (range). Accordingly, the length of your trips on your e-bike plays an important part in your choice of battery. The greater the distance you travel, the greater the battery capacity needs to be. On the other hand, a battery with more capacity is generally more expensive to boot. Battery capacity is expressed in ampere hours (Ah) and watt hours (Wh). Unlike watt hours, ampere hours do not take account of the voltage while the battery is discharging. It is best therefore to assess batteries based on the watt hour rating. The higher this figure, the longer you can cycle with assistance. Most e-bikes are supplied with a battery as standard. If the bike is not fitted with a battery as standard, then you will need to choose the battery capacity yourself, which will give you (more) control over the price of your e-bike. Weight: it holds in this respect that the weight of the bike as well as that of the rider will affect the range. The more weight the motor is required to assist, the shorter the range. Resistance: this applies not only to the weather conditions (headwind, rain), but also to tyre pressure and the condition of the road. Higher resistance will have an adverse impact on your range. Speed: the faster you cycle, the shorter the range will be. The e-bike will provide more assistance at higher speeds. Assistance: with regard to the assistance setting, it holds that the lower the setting, the longer the range. Shifting: If you shift efficiently while you are cycling, i.e. in good time and regularly, this will have a positive impact on your range. Make sure you use a lower gear and always shift down to the lowest gear when standing still. Battery: both the condition and the age of the battery will affect the range. An old(er) battery will have reduced capacity, thus providing a short(er)range. Sensors: the type of sensor can have an impact on range. In general terms, a pedal force sensor is more energy-efficient than a rotation sensor. There is a great deal of information available on (buying) e-bikes, and you may have a preference based on this information for a specific e-bike and/or (technical) components. There is also the possibility that members of your family or your friends can advise you based on their experience. However, there is only one way of getting to know whether you are really making the right choice: have a test ride. On a test ride on the e-bike of your choice, you will find out whether the experience and use of the bike meet your expectations. 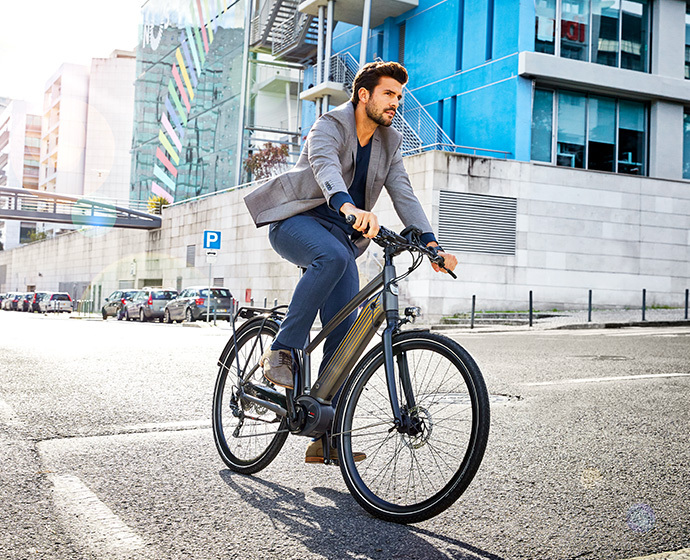 Take advice from a specialist in the field of e-bikes and try out different types and configurations before making your final choice.